I've had my legs sprayed with analgesics before, but by the time I resorted to them, my legs were too numb to feel anything. I have a soft spot for these because I associate them with the emotional highlight of my first marathon. However, I learned that you don't have to run 26 miles to benefit from such sprays. 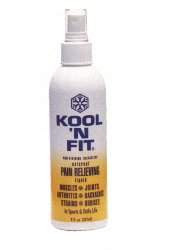 The Kool-n-Fit spray feels tingly, and as its name implies, cool, when it hits your legs, much like a menthol cough drop. It has a slight citrus scent, which makes it slightly more tolerable to the olfactory nerves than other sprays. I headed over to a Kool-n-Fit booth after my recent half-marathon, which was lucky for me, since that's where I found my sisters, almost as if they had been counting on me to be in pain, ha ha. I LOVE this stuff too. I think I just like the smell. I had them spray me every chance I got!